Mounting Screws for Mounting Standards, #6 x 2"
Installing Heavy Duty Brackets for Wall Standards ensures that any product placed on the shelves will be structurally reliable. Adjustable Brackets gives you flexibility with four different angles to lock into. All of our Heavy Duty Brackets and Accessories for Wall Standards are durable because they are made of 1/16” chrome steel. Numbers just don’t do justice, it has a solid feel and builds. These brackets can support heavy hardware tools, utility belt, laptops, or display mannequin’s heads. 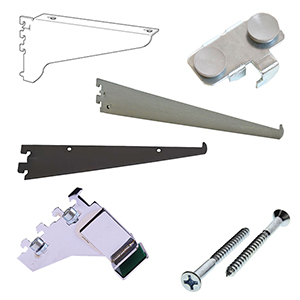 Our heavy Duty Brackets fit comfortably into our Wall Standards with 0.5” slots and can support Melamine Shelves, Bullnose Shelves, and other Shelves we have in-stock. Majority of these brackets will take up about 4-5 slots due to its build. Brackets is one of the main components in setting up your own wall system which you can find at American Retail Supply. Call if you have any questions or need help ordering at 1-800-426-5708. This is produced in accordance with major U.S. manufacturer's standards with regard to steel hardness and wall thickness. Some imported lines may not meet these exact standards. The Heavy Duty Wall Standards is recommended for the most severe loads and where traffic conditions demand a more durable line of hardware. General specifications: .125" steel thickness.